To protect availability, problems have to be resolved quickly and accurately to minimize disruptions. Outages due to human error—the most common cause of outages—have to be minimized, and when they do occur, the mean-time-to-recover (MTTR) from them has to be swift and efficient. Security threats take on even more importance at the data center. Systems must be patched rapidly to minimize the impacts of outside threats. Unauthorized changes have to be detected and quarantined quickly to not only ensure the protection of business-critical information that resides in the data center, but also to protect uptime. In addition, routine maintenance procedures require standardization and consistency to protect system availability and security. Solutions are needed that can quickly and effectively address the availability, security and support challenges that administrators face in managing the data center. 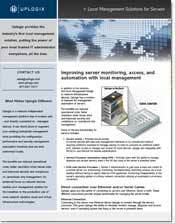 SOLUTION BRIEF | In data centers, Uplogix continuously monitors network devices and servers to proactively identify, diagnose and resolve potential problems and security threats autonomously—ensuring the highest level of data center availability and security. The automated support features of the Uplogix can drastically reduce the time spent on routine data center maintenance tasks, leading to greater standardization and lower support costs. Via the Uplogix Control Center, data center administrators can get up-to-the-minute operational data and visibility as well as integrate collected information into other existing management systems. In this Uplogix Support Short, learn how to set re-occurring jobs and tasks using the Uplogix Control Center.